Some days you just cant understand whats going through the minds of fish as when me and Neal arrived at the lake in far from ideal conditions we agreed that we were starring a blank in the eyes, yet the fish had other ideas. 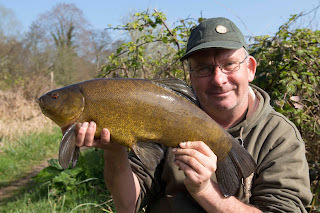 First cast and a tench graced his net which was the start of not hectic sport but steady sport as the indicator kept dancing and the rod kept bending. Here are just a few of the fish that Neal caught during out latest session. February got off to a good start and then slowly drifted back into my appalling run of form, however I just hope March isn’t the same as once again the month started in style this time producing a personal best equalling golden orfe weighing 6lb 5oz. My mate Chris went one better with one of 6lb 8oz! Most anglers will now know that I have taken over the ‘Where to Fish’ for the South East of England, a post that Bill and Virginia Rushmer previously did for well over a decade. I wish them well and hope that I can continue the good work they have done. To say it’s easy is an understatement and the most frustrating factor is just getting hold of certain fisheries as the last thing I want to do is to insert any incorrect information, not just things like the price of a day ticket but misinforming you how a venue is fishing, however I’m now five weeks in and the task is getting easier each week. If you know of any fisheries that I haven’t mentioned then feel free to email me some information and if you have caught a good fish or had a bumper catch from any in my area then send me an image plus some basic details and I will try my best to get you shown within the magazine. Although getting this column sorted is time consuming it’s also very rewarding as I get to hear of what’s being caught, something that I know will work to my advantage in tracking down and catching, you never know, a few new personal bests. When it happens you will be the first to know! shows, video producing, guiding and feature writing have all been part of it, however getting out for myself has also featured. Eight times in fact and although most, no all have only been for a few hours fish have at long last been gracing the landing net on a regular basis. Probably one of the most rewarding sessions was when my good friend Tom took me chub fishing for a few hours and repaid me for an earlier trip when he had lost his enthusiasm, caught a 5lb 9oz chub and seriously got the bug again. I have also lost some enthusiasm for my local rivers so a trip to a new venue saw a number of chub landed, but even better was we never saw another angler, happy days. I was actually looking forward to the rivers finishing, yet those few hours rekindled the passion and I was disappointed when it ended. One thing I will be doing come the opening of the rivers is heading to the river Wye a few times. Size really doesn’t matter anymore but catching a few for my efforts does, something that’s so hard locally to do. I have also got a ticket to a river that I have never fished before, heard lots about and have for a time wanted to fish so will be treading the banks of somewhere altogether new and hopefully once again catching a personal best or two. I can’t wait. Quality roach and rudd, early season crucians, modest perch and bream have all featured in catches but it’s been the tench that seemed to have woken up first as loads have been caught, the best 6lb 9oz. Another session that showed just what a great leveller angling is, is when I sat next to my dad at Badshot Lea and got a right good stuffing of the next peg. I struggled for a couple of tench, but dad, well he just kept the bream coming along with a tench and just to rub salt into the wound, a near twenty pound common. He’s not coming again! feeding the fish in the same area and this is what I was faced with on this occasion. I thought I had this particular fishery sussed and have never blanked, yet after seven hours decided it was time to throw the towel in as nether myself or fishing mate Chris had received a bite. Just before leaving a took a stroll down to the corner of the lake, an area that’s roped off with a fish feeding machine installed and even before I got close could see that every fish we were targeting was sitting safely below. Now I can see why a fishery wants to feed its fish and keep them in tip-top condition throughout the winter, but surely when anglers are paying money to fish the lake then it should rely on them to feed the fish and possibly catch them whilst doing so. What irritates me more is the fishery is feeding the fish on a bait that anglers aren’t allowed to use, somewhat hypercritical I feel! If you want to artificially feed the fish then please do so but don’t take money of anglers whilst doing so. I could well have trickled some bait in, got them feeding, then when no one looking sneaked one out, something I’m sure others have done, but to me that’s just not fishing! Anyway, as my mate Alan would say, your moaning again, so on a better note have you all got your ticket to The Big One which is at Five (Farnborough Airport) on the weekend of April 8th and 9th. I will be on the Nash stand on both days so please pop down for a chat. April is already looking like it’s going to be a mega busy month, however I am going to get some time off and relax this month and you never know, might just drop a whacker in the net. 02/03/17 – Headed to the Loddon in the rain for a spot of morning chub fishing. Not the most comfortable conditions for roving around but managed a couple of bites, one missed and one converted into a chub not quite 4lb. 03/03/17 – Still spending lots of time in the office but on the better side of things. 04/03/17 – Headed down to Willow Park to meet up with Jake Lund and Tom Weymouth to take a few images for an up and coming Anglers Mail feature. 05/03/17 – Up early and on the road come 6am, this time heading to Newdigate for a change in scenery and hopefully a bite or two. In all honesty most would have looked out of the window or seen the weather forecast and stayed at home, yet I had planned to meet my mate Chris at 7am so into the gloom it was. Rain, rain, rain, oh and wind came our way which isn’t the best as the lake we fished at Newdigate is on the top of a hill and when the weathers bad its seems twice as bad here. Brave it we did and stuck to our guns of leaving the tench alone and fishing specifically for the orfe and come mid afternoon five bites had come our way. My two produced a personal best equalling orfe weighing 6lb 5oz, the other was lost from a hook pull, while Chris had three bites, one missed, a two-pounder and a personal best orfe weighing 6lb 8oz. weekly AM magazine and all will be revealed. 8/03/17 – A day in the office writing yesterday’s article along with getting my weekly venue column started. 9/03/17 – Office day sorting articles etc. around in good conditions and caught quite a few fish. I had a trout plus two modest chub on cheese paste whilst Tom stole the show with chub of 4lb, 4lb 7oz and 5lb 4oz, oh and a trout. Shame the season is almost over as really enjoyed the few hours I was out and really wanting to check out the stretch more. 12/03/17 & 13/03/17 – A couple of days in the office again sorting out venues for an Anglers Mail Holiday special later on this month. By the time this is read you all should know what my new assignment is. Bloody time consuming but equally as rewarding! 14/03/17 – The start of a busy few days as up at 5am ready to meet my good friend Paul Garner for a spot of tench fishing. 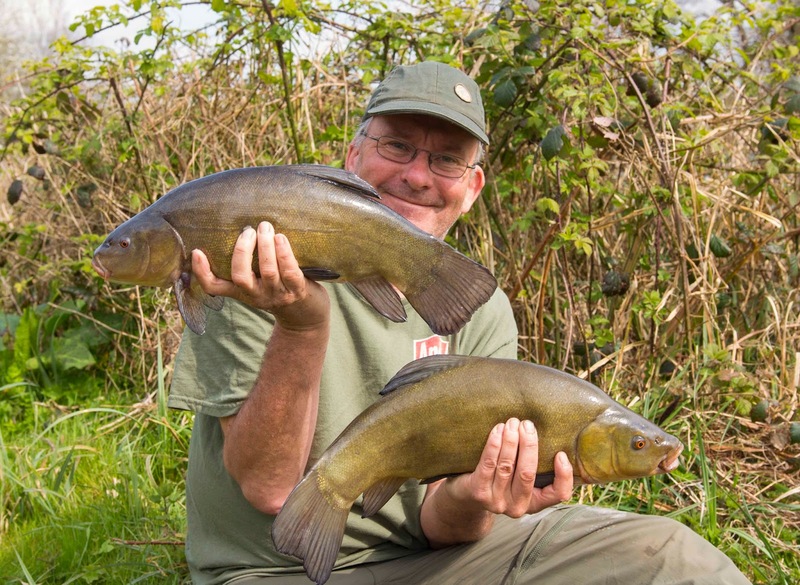 Things didn’t quite go to plan as we caught everything but, well Paul did catch one modest tench. Things are certainly beginning to liven up but these cold morning still making things difficult but good to see that the crucians are on the feed. 15/03/17 – I really should have stayed at home as loads of things to get sorted but up again at 5am as its my mate Chris’s birthday and headed to Newdigate for a spot of golden orfe fishing. The weather was great for fishing, mankini weather, but crap for catching and after seven hours without a bite between us we called it a day. Fortunately we left happy as defeat was unavoidable! 17/03/17 – Not another 5am start? Yes and once again at Milton Lake this time to team up with venue regular Barrie Edwards to see how the pellet cone will work. It was Barrie who introduced me to the cone a couple of years back, and you know how I have used it with devastating effect. If you want to learn more then you need to keep buying your weekly Anglers Mail where all will be revealed. 18/03/17 – Spent a few hours with good friend Tom Aldous and mate Chris to get to know how to take some basic video footage. 19/03/17 – Sunday’s are now weekdays as spent the day initially finalising a ‘Where to Fish’ article before writing an Anglers Mail ‘Catch More’ article then getting up to date with other angling paperwork such as writing this up. caught but had to leave at 7pm. 21/03/17 – Met my dad at Badshot Lea at 6.30am for a spot of bream fishing. A bright blue cloudless sky and a really cold S/W wind didn’t make things easy but dad fishing the FTO rig bagged ten bream around 5lb plus a 20lb common. I tried something different in the hope of a few tench but after feeling I was getting a right good spanking off the next peg switched to the FTO rig and bagged a couple of 5lb tench. My girlfriends dad and mate John struggled for the odd bream but not ideal conditions and just great to get out and have a catch-up on the bank. Packed up at 1pm and bank in the office for a few hours paperwork. 22/03/17 – Spent the day sorting out my Anglers Mail ‘Where to fish’ column. 23/03/17 – A day again sorting fishy related paperwork, along with creating a photo slideshow which was presented at Grayshott Angling Clubs AGM in the evening. 24/03/17 – In the office in the morning before heading to Enton for a few hours to meet up with an angling mate. Fished from 5pm – 8.30pm for four tench, the biggest around 6lb plus a rudd around 1lb 8oz. 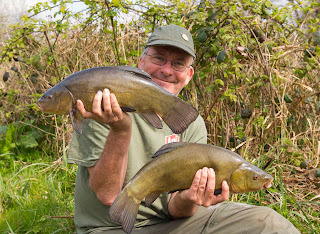 Alan had four tench, best getting on for 7lb. 25/03/17 – Up early and on the road heading to Nash Royston Lakes in Cambridgeshire to lend a helping hand at a work party. Got loads done and managed to get away by 3pm. 26/03/17 – Spent a good five hours writing an Anglers Mail article called ‘The Specialist’. Will let you know when it’s published. 27/03/17 – Sounds like yesterday, that’s because it was......spent a good five hours writing an Anglers Mail article called ‘The Specialist’. Will let you know when it’s published. 28/03/17 – Time to try and get a few videos done so after picking Tom up we headed to Enton, no not for crucians but tench. When the video is ready to view it will be available on my website but thumbs up as we caught a few in far from ideal conditions. 29/03/17 – Spent the day sorting out my next Anglers Mail ‘Where to fish’ column along with other fishy related items and getting the kit ready for an early start in hope of a few perch. 30/03/17 – Up at 5am, arrived at Passies for just after 7am, fished the main lake for a few hours but hard, a few modest roach and the odd carp before moving to the Match Lake where we were well and truly beaten up by carp. If you want to get a few, no loads of bites then this is the place to head to. 31/03/17 – Another early morning and back on the banks of Newdigate come 7am, this time to help out a friend with some images he required. Unfortunately the catch images that we were looking for, an orfe or tench over the landing net never materialised as the lake was once again in one of its unforgiving moods. Paul did catch a personal best orfe, early on but a technical problem meant that any catch images weren’t taken. Two other very good anglers also failed to catch, well that was the case up until just after midday when once again the white towel was waved high in the sky and we headed home.